This recipe is a mouthful – a delicious mouthful. For the most part, I followed this recipe from Evil Shenanigans almost to a T. The only difference is that I always add more vanilla extract than normal and I always, always, always melt my butter before I put it in my mixer. Fun Tip: If you put parchment paper on the pan and leave a few inches hanging over the side, the bars will (should) slide right out of the pan. And there’s less clean-up. YAY! 3. 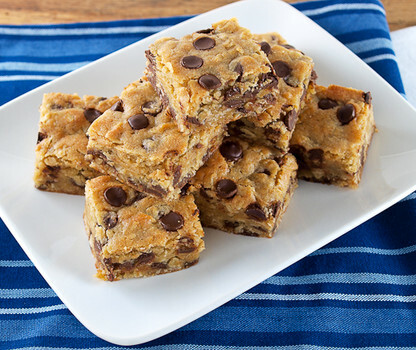 In a medium bowl, combine everything but the oats and chocolate chips. 4. Add oats and chocolate chips. Fold in gently. 5. Spread mixture onto parchment paper and bake for 25 minutes. Let cool before slicing.